Well at least you did the cables the same way all across the row! I love that color! LOVE. I’ll keep my fingers crossed that you don’t run out of yarn and that you get some time to knit like the wind on Saturday. Gorgeous. I love your sense of taste. Ooooh, I love the orange! It looks great, wouldn’t see the cable errors if you hadn’t pointed them out. Looking great! That color is wonderful, and the cables really pop! BTW, thanks for the MSP neighborhood recommendations! I’ll have to do some exploring when I’m home in late March. Oh this is so pretty…love that cable! 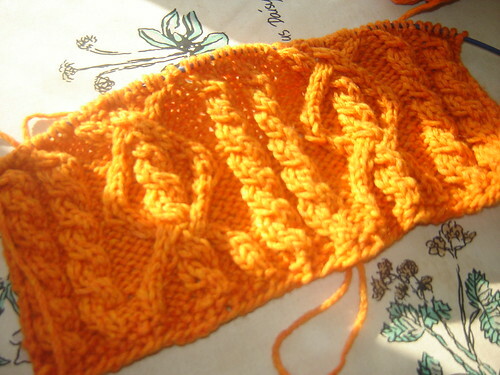 Knitting and olympics…sounds good to me.